ARE YOU A BUSINESS OWNER STRUGGLING WITH DEBT? Law Offices of Eric Slocum Sparks, P.C. If you or your business is struggling with debt. If creditors are harassing or embarrassing you in front of employees, Bankruptcy may help. No two Bankruptcies are alike, but the decision to file a personal or business Bankruptcy is always difficult. If you choose to file on your own, or hire a Lawyer that does not have the experience specific to your needs, the results could be disastrous. You owe it to your family, your business & your employees to find the best Bankruptcy Attorney for your situation. 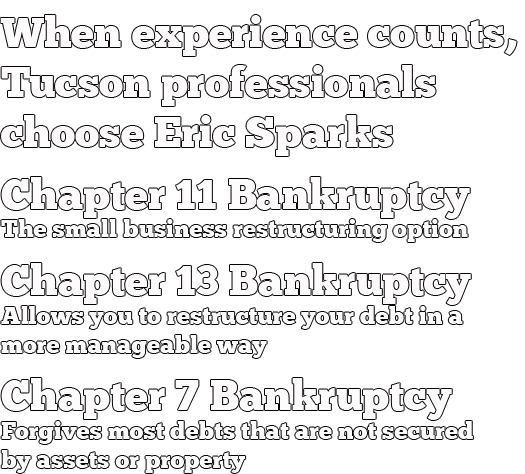 Eric Slocum Sparks has the extensive legal experience you need to navigate the complex Bankruptcy & other legal issues that might arise. Since the 1980s, we have represented thousands of clients and issues in many core industries including Building & Construction, Contracting, Real estate, Ranching, Farming, Restaurants & food industry, Professional Services/Consulting, Retail, Manufacturing, and many more. While we have represented several large, multinational companies and high-wealth individuals, it’s the small-business owner or entrepreneur and the families who we take special pride in representing. Call us today or fill out the form and we will get right back with you. Eric is the simply the best! Would not want anyone else representing me. We've referred him to 4 of our friends and they all feel the same way. I have known Mr. Sparks since 1995. He has handled three separate very complex business and bankruptcy matters for me and my wife with perfect results (both Ch7 and 11).. I have recommended him to five different friends for their bankruptcies (two 13s and three 7s) and each tells me they were extremely satisfied with his work. Two of the cases are on-going. Knowing him as well as I do it is inconceivable to me that any fair-minded person could possibly find any problem with any his work. I am 76, and have been in various businesses, including F500 upper management, for 40 of these. As a venture capitalist I have bought and sold eleven different companies,, frequently going the Ch11 in/out route, and have known literally dozens of bankruptcy attorneys. Mr. Sparks stands out in my mind as the best with whom I have ever worked, either for business or personal litigation. That answer, like so many others in law, is that “it depends.” Most people that declare bankruptcy are able to keep their houses throughout the process, but some are not. There are many factors that determine whether you can keep your home in bankruptcy proceedings that is why it is vital that you select an experienced, competent Bankruptcy Lawyer. A different question is whether it is a good idea to keep the house if it is fully encumbered ( that is, the debt on the house is equal to or greater than the value of the house). Sometimes, debtors have taken out home equity loans such that all of the value in the property is pledged to lenders. Or, the cost of paying the mortgages is greater than the cost of renting comparable housing. Part of getting a fresh start may be walking away from property that is a greater burden than an asset. It’s just a house. 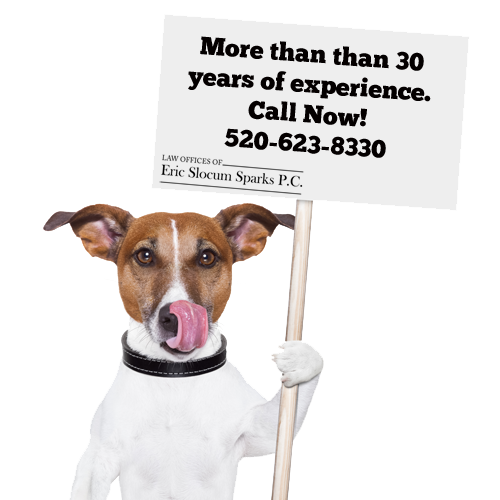 Call us Today at 520-623-8330. The initial consultation is free and we can help you explore your options. After bankruptcy, you can recover good credit in about two years. Filing for bankruptcy does not mean 7 to 10 years of bad credit – that is a myth. Credit card companies usually offer you new credit cards right after the bankruptcy is over. Qualifying for a mortgage will take about three years after bankruptcy. Chapter 11 bankruptcy can also be called rehabilitation bankruptcy. It’s much more involved than chapter 7 as it allows the firm the opportunity to reorganize its debt and to try to re-emerge as a healthy organization. What this means is that the firm will contact its creditors in an attempt to change the terms on loans such as the interest rate and dollar value of payments. Like its cousin, chapter 11 requires that a trustee be appointed; however, rather than selling off all assets to pay back creditors, the trustee supervises the assets of the debtor and allows business to continue. It’s important to note that debt is not absolved in chapter 11: the restructuring only changes the terms of the debt, and the firm must continue to pay it back through future earnings. Chapter 13, sometimes referred to as “wage earner” bankruptcy, may be your only choice if the court determines you have the income to repay at least a portion of your debts. Filing for Chapter 13 bankruptcy allows you to pay your debts in installments over an agreed-upon time period, usually three to five years. The court must approve your plan to repay all or part of the money you owe. Many people who want to keep property, such as a house or car, turn to Chapter 13.